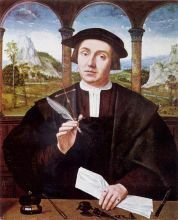 Quentin Matsys, his first name also recorded as Quinten or Kwinten and his last name as Massys, Metsys, or Matsijs (1466 - 1530), was a painter in the Flemish tradition and a founder of the Antwerp school. He was born at Leuven, where he was trained as an ironsmith. Near the front of the Cathedral of Our Lady in Antwerp is a wrought-iron well, known as the "Matsys Well," which according to tradition was made by the painter-to-be. During the greater part of the 15th century, the centres in which the painters of the Low Countries most congregated were Bruges, Ghent and Brussels. Leuven gained prominence toward the close of this period, employing workmen from all of the crafts. Not until the beginning of the 16th century did Antwerp take the lead which it afterward maintained against Bruges, Ghent, Brussels, Mechelen and Leuven. 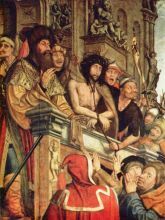 Matsys, as a member of Antwerp's Guild of Saint Luke, was one of its first notable artists. 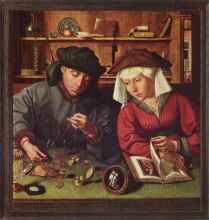 A legend relates how Matsys, while a smith in Leuven, fell in love with the daughter of a painter; by changing his trade to painting, he hoped that she would love him in return. Less poetic but perhaps more likely is another version of the story: Quentin's father, Josse Matsys, was clockmaker and architect to the municipality of Leuven. The question arose as to which of his sons, Quentin or Josse, should follow in this lucrative business. Josse the son elected to succeed the father. Quentin then took up the study of painting. 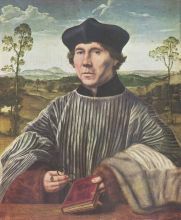 We are not told expressly by whom Matsys was taught, but his style seems to have derived from the lessons of Dirk Bouts, who brought to Leuven the influence of Memling and van der Weyden. 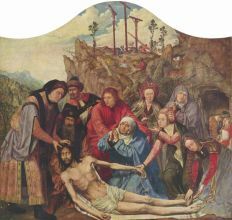 When Matsys settled at Antwerp at the age of twenty-five, his own style contributed importantly to reviving Flemish art along the lines of van Eyck and van der Weyden.